This multi-purpose media center was designed to accommodate a large television set, playstation, stereo components, and storage for DVD's, CD's, and movies. 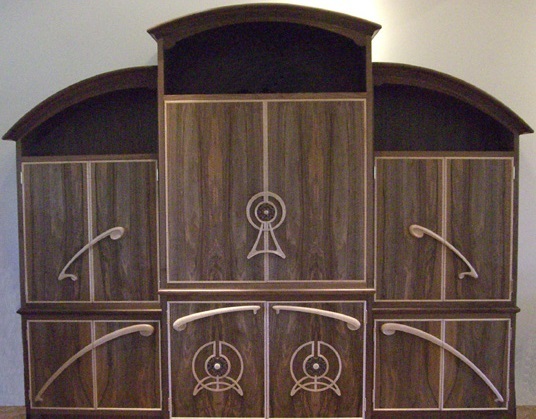 It is built of black walnut with curly maple door handles and interior drawers. The design of the cabinet door handles evolved from the work of the Art Nouveau artist Alphonse Mucha, and suggest a music clef and notes on a scale. Much of our casework - from desks to media centers to bureaus to armoires - have a primary function as storage. We pride ourselves on the interior fittings of our cases, as much as the aesthetic design of the exterior. We understand that clutter is almost always non-aesthetic, yet most of us have collections that we seek to keep, if not display. If you have specific storage challenges, do not despair. 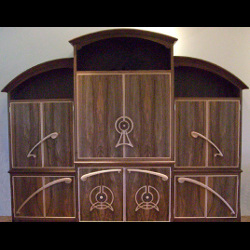 Our foundation is in case goods, and we will be very happy to design beautiful furnishings to accommodate your stuff.